Sunday morning. A beautiful sun is shining above Paris and we decide to head for the Marché des Enfants Rouges. Once an orphanage, it became a lively market in 1615 in the middle of the newly built district Le Marais. In remembrance of the orphans who were dressed in red clothes, the inhabitants of le marais called the market after them (the Market of the Red Children). This half covered market is still the center of the quarter and it’s very nice to walk around on it on a casual Sunday morning. We started our morning with a late breakfast at one of the several food stalls. We choose the breakfast menu (croissant, juice, hot drink, spreads) at the colourful L’Estaminet des Enfants Rouges, the ideal place to see how every salesman is setting up his booth and how they are preparing for the constant flood of customers. Once the market got busier, we started sauntering between the different stalls. And ok, even if you have the fish, vegetables, fruit, bread and flowers you’ll find on a normal market, the setting and the history of this place gives it that special couleur locale. But at the same time, there is this exotic atmosphere that reigns over this place. By walking from one food stall to another, you make a little trip around the world. We had already tried the Moroccan mint tea at the oriental stall, dreamt about future far voyages with a Creole cocktail and we got in a Mediterranean mood with some Italian pastries. You easily get in a holiday mood, especially when you stop at the vintage photo shop with postcards of several holiday destinations. This time, we queued up at Chez Taeko for a delicious Japanese bentō with mackerel, sushi, rice .. We paid about 13 € for the bentō, and as we’d read that the cake with green tea is worth it, we added it to our order. One tip: arrive early enough to pick out a table at the food stall of your choice if you want to eat on the spot. 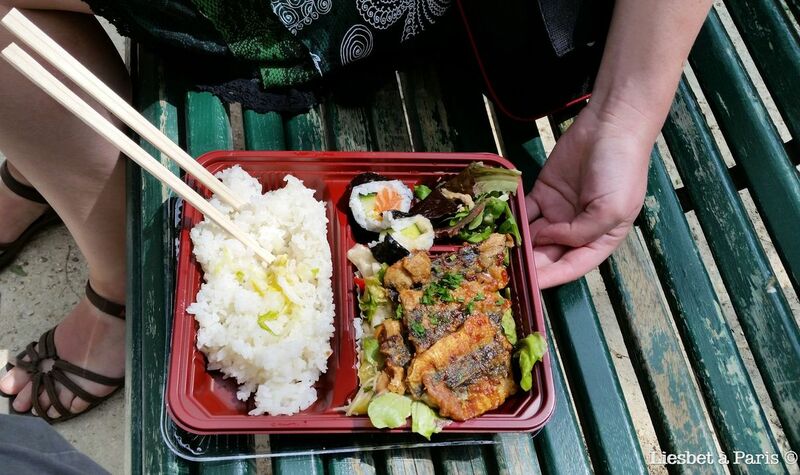 Or do as we did: we took it as take away and picknicked in the Square du Temple, a park just around the corner. And it has to be said: the bentō and the cake were de-li-ci-ous. The market is open from Tuesday till Thursday from 9h – 14h and from 16h – 20h, from Friday till Saterday from 9h – 20h and on Sundays from 9h – 14h. With the metrostations of Filles du Calvaire, Temple, Arts & Métier or République in the neighbourhood, it is easy to go to this spot. If you use the Arts et Metier Metro station, there is also the wonderful museum of the same name, as described in the opening chapter of Umberto Eco’s ‘Foucault’s Pendulum’ which you can see in the museum .